Polaroid cameras have been around for decades but they have undergone some changes over the years that continue to have them loved by photography fans and enthusiasts. The best Polaroid camera will have lots of features that allow you to edit and adjust the photo however you want and then print it out immediately. Our pick, Polaroid Snap Instant Digital Camera, has tons of features that allows for loads of fun while with family and friends. Polaroid was initially created in 1923 and was the first commercially available product released in 1948. They were an immediate hit with people who wanted instant gratification and the ability to see their photos right away rather than waiting for the film to be developed. They were also popular in many commercial and business settings as well. Older, traditional Polaroid cameras are not as popular as they once were due to the digital camera popularity but they are far from over. Polaroid cameras have changed in looks to reflect consumers’ love of high tech and they can still be purchased brand new today. 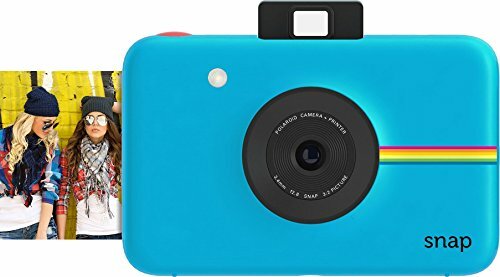 While instant prints are not as popular or needed in this digital age, there has been a slight shift back to these well known and well loved cameras, especially among the “selfie” crowd where it’s tons of fun to take pictures with all of your friends and have instant pictures to show for it. There are several things you want to learn and look for regarding Polaroid cameras to make sure that you purchase the right one for your needs. This knowledge will help you make an informed decision that will result in a camera you love to use. 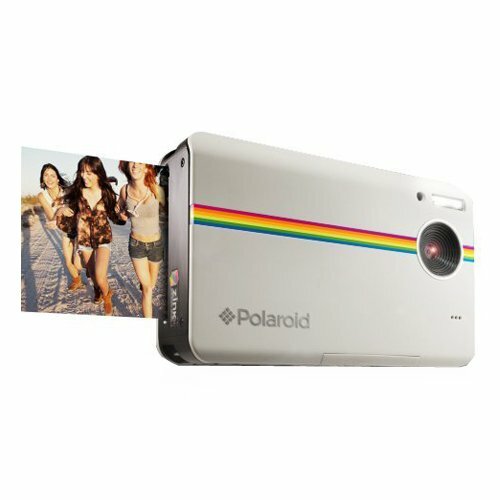 The newest addition to the Polaroid instant digital line is the Polaroid Snap. It provides you with 10 mega pixels in a compact size that is easy to slip into your purse, bag or pocket so you are ready to snap those keepsake photos. Features include a micro SD slot that holds up to 32GB of storage, an integrated ZINK instant printer that produces 2” x 3” full color prints in less than a minute. Each photo has a convenient adhesive backing that makes it easy to stick the photos to a scrapbook page or anywhere else you want to stick it. Each photo has a digital backup copy that you can use for sharing on social media. This simple to use, affordable Polaroid camera takes instant photo technology and improves it to keep up with the preferences of today’s photo loving consumer. This easy to use camera turns on by raising the viewfinder; when you’re done just lower the viewfinder and the camera powers off. The Polaroid snap is so fast that you can snap a picture even while the previous shot is printing. It features a timer for selfies and 6 different capture modes to choose from including sepia and black and white. The low battery indicator ensures that you’re never caught with a dead camera. There is also a no paper indicator as well. The built-in lithium battery is long lasting and recharges quickly. You can choose from red, black, blue or white. This camera makes a great gift for a teen or pre-teen. There are a lot of fun features that the Polaroid Z2300 offers. Some of these features include built-in memory, the ability to immediately print 2” x 3” photos, editing capabilities, the ability to upload photos to social media platforms, an external LCD monitor and much more. Not only can you see your photos instantly you will be able to crop them, apply filters if desired and even add fun borders. The 2 ½” LCD screen lets you view your images before printing and offers picture taking features like anti-shake image stabilizing and a 6x digital zoom. You can add up to 32 GB additional storage. Not only can you take fun photos with the Polaroid Z2300 you can record 720p HD videos too. The camera has a microphone as well for audio videos. Users can choose from 5 different picture qualities, three choices of compression quality, 5-mode flash strobe, picture metering, white balancing, time stamping and smile detection. Those who love taking selfies of themselves and their friends and interacting on social media will love this Polaroid camera. You won’t have to worry about any computer connections, ink cartridges or hassles when using this fun camera. You can upload additional custom borders for even more editing options. The smudge-proof photos that you print from the Z2300 have an adhesive back with peel-off paper that allows you to stick your photos wherever you would like. You can also print in black and white if you desire. The Polaroid PIC-300 instant film camera is a flashy looking modern version of the classic Polaroid camera. Features of this fun camera include 4 scene settings that will help you catch any picture in a variety of light conditions, an auto flash feature, manual exposure compensation, 1/60 sec electronic shutter and much more. The camera automatically prints photos that are about 1.8” x 2.4” which is roughly the size of a business card. These photos will be ready to share in just minutes. The photos that are printed out are dry to touch with no smearing, are water resistant and have an adhesive back. This fun adhesive backing allows you to stick your photos wherever you want without damage to the surface you stick it to or the photo itself. 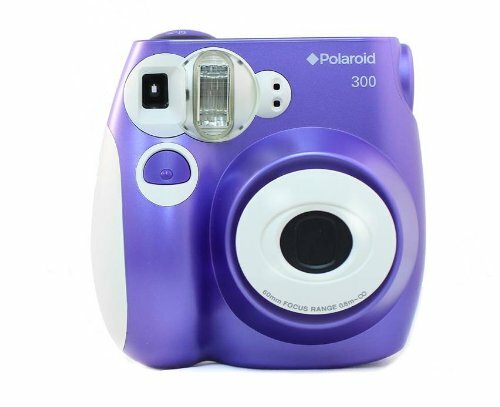 The Polaroid PIC-300 uses Polaroid instant color film only. The camera has an auto shut off that kicks in when it’s not used for 5 minute with the power on. The lamps will turn off and the camera will enter energy saving mode. Resetting the camera is easy; just press the shutter release button and it will reset to the power on mode. The camera is easy to use, even for beginners and produces keepsakes for friends and family of your fun outings and activities within minutes. You will be able to easily keep track of your pictures with the easy countdown that the camera does as pictures are taken. This Polaroid camera uses four AA batteries. Although the popularity of digital cameras have caused older Polaroid cameras to take a hit, there are still plenty of people that love them. The new features, capabilities and look that Polaroid cameras have make them an excellent choice for pre-teens and teenagers to have fun with their friends. They are very easy for beginners and kids to use and have a lot of fun features that will keep them busy for a long time creating custom photos that they can stick on their notebooks, book bags and share with their social media channels. The three Polaroid cameras we have reviewed above are all excellent cameras that can be used for a number of things from having fun at a birthday party to business and commercial uses. Any one of these Polaroid cameras is a great choice for those who enjoy having the ability to print off instant prints and share things on social media. Read our buyer’s guide below to learn more about Polaroid cameras and how to choose the best one for your needs. There are several things you want to take into consideration and this guide will help you discover what those considerations are and how to use this information to make an informed decision that you will love using for years to come. Polaroid cameras have many features that digital cameras offer plus other capabilities that make them really fun to use. We have listed these features below so you can see which ones are important to you. Once you know what features you definitely want, make sure that the Polaroid cameras you look at have those features. Display – Some models of Polaroid cameras have LCD display screens so you can see your images before you print them. The displays are color and allow you to do any editing you want to do prior to the printing process. The display screen also allows you to see video clips and adjust settings, etc. White Balance – White balance options can include manual white balance, cloudy, fluorescent, daylight, and incandescent. The white balance option allows you to adjust the light and make it better regardless of what kind of light is available for the photo. Most photographers use white balance when the pre-selected or default one is not giving the right image quality. Dynamic Lighting – If your lighting conditions are not the best, you can use dynamic lighting to create the image quality you desire. Dynamic lighting works by brightening the areas of the photo that are underexposed and balancing the areas that are overexposed. This will help compensate for lighting that is less than favorable. Blur Function – This feature is relatively new in Polaroid cameras. It works by selecting the continuous mode automatically whenever it detects a blurry photo. Multiple Image Layout – This unique feature allows you to string together three shots to make one single image. This is terrific for putting the photos in an album that are unique. Red-Eye Effect – Red eye is a common problem with images. The red eye function will find the red eyes in the photograph and fixes them. The red eye function prevents photos that are otherwise great except for the red eye from being ruined. ISO – ISO determines the sensitivity that is required to make a visible image that you will be happy with. Higher ISO results in a grainy or pixilated image. Polaroid cameras have ISO ranges from ISO 100 to ISO 400. Saturation and Sharpness – These two features help you improve the image quality. Sharpness options include standard, soft, and hard. Saturation options usually include low, high and standard. The saturation and sharpness settings will vary from image to image. Self Timer – Self timers are great for taking selfies and group photos where you want to be in the shot too. The timer settings can be adjusted for different delays depending on how much time you think you will need to get into position. Video Mode – Some Polaroid cameras have a video mode that allows you to record video clips in 720p. Most cameras that have video recording capability can record about 30 seconds of video. Some have microphones as well. Resolution is usually 320 x 240 or 640 x 480 pixels. The videos can be uploaded to your social media channels as well if you choose. Storage – While the Polaroid camera will have some internal storage they also offer the ability to add a microSD card for additional storage if needed. Since the included storage is not usually very much, it is recommended that you purchase an additional SD card. The description of the item will let you know what size microSD card to get but most can handle up to 32GB. Color choices – Depending on the model of Polaroid, you can have a selection of color choices to pick from. The look and design of the Polaroid camera has changed a lot over the years. No longer is it huge and bulky and hard to hold. Nowadays they are sleek, available in many flashy, attractive colors, and are much smaller. Some are so compact they fit easily in your bag or pocket. Adhesive Backing – Many of the newer Polaroid cameras print photos that have adhesive, peel-away backing that you can take off. This allows you to stick the photos anywhere you choose from notebooks to scrapbooks. Smudge-Proof/Water Resistant – One of the pluses about the photos that you can print out from the Polaroid cameras is that they are dry to the touch immediately after printing. You won’t have to worry about the photo smudging or getting ruined. Some are even water resistant. Polaroid cameras come in a wide range of prices to fit every budget. One of the considerations to think about when purchasing a Polaroid camera is the cost of the instant film as well. The description of the camera will tell you what type of film to get for your Polaroid camera. You can purchase the instant film online, probably the same place that you purchase your camera. Amazon has many excellent instant film choices. Even now, decades after its invention, Polaroid cameras are fun and popular ways to have instant photos at your fingertips. You can still purchase the old, vintage style Polaroid camera but the company has made some improvements on the new styles that are keeping them popular with some people, especially teens and preteens. With all of the new choices available it can be overwhelming to figure out which one will suit your preferences the best. The purpose of this buyer’s guide is to give you information about the different models of Polaroid cameras that are available and the common features that they will have. The three top rated choices we have featured above are all great choices. Use the information we have provided in this guide to help you figure out which model of Polaroid camera fits your needs, activities and preferences the best.